A blond beer flavoured with cherry extracts and black carrots. This blond beer flavoured with cherry extracts and black carrots has been crafted according to the recipes of the Bokonos or voodoo wizard's, who use bewitching plants and herbs to cast their spells. As an homage to these voodoo wizard's, the Bokono beer has a bloody colour, symbol of the strength of the Bokono sorcerer. This bottom-fermented beer has been filtered and pasteurised. Bokono is brewed in France, in the Vosges. Bière du Sorcier (The Wizard's Beer) has been crafted by an engineer, master-brewer and inventor of speciality beers. 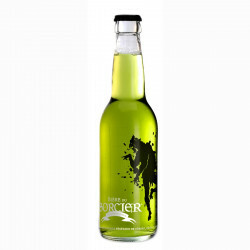 Its green colour originates from the nettle used as a special ingredient of the beer. Ingredients: water, malted barley, sugar, wheat, acidifying agent (citric acid), black carrot juice (concentrate), natural flavourings, hop.